We are dedicated to growing the game we love and creating a more sustainable hockey community. The core of our mission starts with a hockey stick we think should be in every player's hands. And we get it to you at a price that won't make you cringe. What's with the "COHO" short name? Remember these beauties from back in the day? Well, if you're one of these young guns you won't remember them. 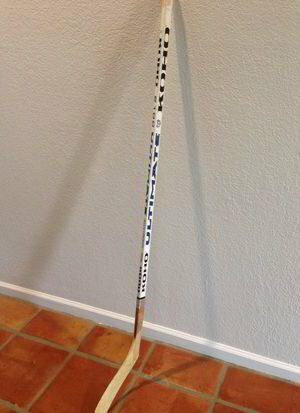 But KOHO was one of the first companies to innovate with hockey sticks back in the 90's. All of us "old-timers" had one growing up and we LOVED it. The name "COHO" is a subtle throwback to show some respect and honor for what KOHO did for every single hockey player. All this new technology wouldn't be where it is today without their work and commitment to hockey. Stick taps for KOHO, everyone. It's easy to overlook one of the most important things about the origin of hockey — that it began on an outdoor rink. RinkWatch is a research initiative monitoring winter weather conditions related to the sustainability of the outdoor rink. We donate 3% of our profits to RinkWatch to elevate dialogue about sustainability practices in the hockey community. It's our way of doing what we can to preserve the natural climate our sport finds it's heritage in. Our dream is to get as many sticks into the hands of children so they can experience the greatness of hockey. #sticksforkids is a program where we donate sticks to kids in need, youth teams, and students to help get them on the ice. Who knows? Maybe we'll be the ones to donate a stick to the next Crosby, McDavid, or Gretzky. How cool would that be? !